Subject: The 160-meter antenna WORKS !!! 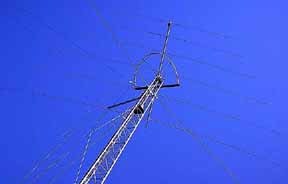 Vertical today and just made my first 4 contacts on 160-meters. bracket 33 feet below. Then, I attached the wires vertically. 142' - 9 1/2", for a 1.4 to 1 SWR at 1.892 mhz. my antenna was working at least as well as theirs. website. Several were interested in your design. interesting to see if I can work some DX. you when the sun comes out.